Mommy's Idea: Giveaway! 1-2-3 Get Organized! Giveaway! Meet Bev of 1-2-3 Get Organized. 1. Check out 1-2-3 Get Organized at http://www.1-2-3getorganized.com/ 2. Come back here and leave a short comment telling us which book you'd choose and why. 3. Be sure to leave your e-mail if you don't have a blogger ID. 6. 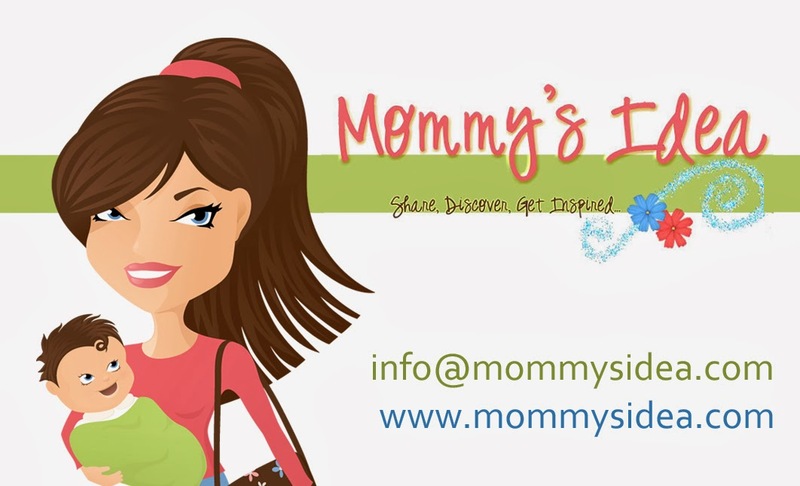 Add our button to your blog or link to http://mommysidea.com/. 8. Join our new forum! http://mommysidea.forumotion.net/ or click on "forum" above or to the left. Contest ends at midnight EST Saturday, September 27th. Good Luck! I’m a professional organizer, speaker, trainer, and author of the 1-2-3…Get Organized series. My husband and I have been married for 33 years and we have two grown daughters. We currently work for Shelter Care as foster parents for teenage girls. What is your business and where can we find it? I have two businesses: Distinctives: Helping You Master the Key Areas of Life and Business (interpersonal relationships, clarity of focus and priorities, maximizing time and energy and organizing your space). I am a facilitator for Myers-Briggs personality type inventories. I do team building seminars with businesses and families, and individual appointments with people who want to discover their unique and distinctive personality type. ww.Distinctives.org. 1-2-3…Get Organized evolved out of the organizing piece of Distinctives. Not only do I help people organize their home, office, and time, but I give seminars and workshops to businesses, moms groups, etc. I have written 17 books in the 1-2-3…Get Organized series, which can be found at http://www.1-2-3getorganized.com/. And I have a blog on organizing tips at http://www.1-2-3getorganized.blogspot.com/. A little about your entrepreneur journey so far? During my 26 years coaching within a non-profit, I became fascinated with personality profiles. After becoming trained as a Myers-Briggs Personality Type facilitator, I started my own business helping people master the key areas of life and business: interpersonal relationships, clarity of focus and priorities, maximizing time and energy, and organizing space - both at home and at the office. Interpersonal relationships: I conduct team building seminars and individual coaching based on personality. Some of my clients have included The World Bank, The Department of the Navy, The Embassy of Jamaica, boards of directors, non-profits, families, married and engaged couples. I also help inviduals discover their own personality profiles as they grapple with careers, college majors, mid-life crisis, and self-image. Clarity of focus and priorities: I help people rethink life or career based on personality type, priorities, passions, and giftedness. Maximizing time and energy: time management, efficiency, and scheduling. Organizing space at home or at the office: functional rooms or work spaces allowing people to work at top efficiency. My specialty in this field is helping people downsize to smaller residences. Combining my personality-watching and my professional organizing, I discovered that those who are most overwhelmed by organization are often very creative and artistic. My recently released 1-2-3...Get Organized series of books and workbooks was written for this audience - colorful, glossy, short books. 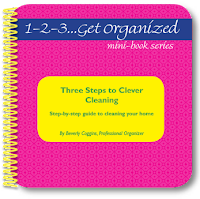 Each book addresses only one organizing task and provides three simple steps to accomplish that task. A sample of the 16 titles: Three Steps to Decluttering, Three Steps to Downsizing to a Smaller Residence, Time Management at the Office, Time Management for the College Student, Organizing Your Office, Clever Cleaning, Organizing Your Kitchen. Where else can people find you? I would like to win 3 steps to clever cleaning. Hassle free dinners. My least favorite chore. You know I love to organize. Thanks for posting this. Nice to read about Bev. and I followed you. Great giveaway, thanks! Three Steps to Time Management for the Working Mom - I am thinking about heading back into the workforce and this is something that worries me. would love the 123 to getting organized- clever cleaning huh? Three steps to clever cleaning. This could be of help. I would love to win Three Steps to Time Management for the Stay-at-home-mom! Three Steps to Clever Cleaning; I'm in desperate need. I would love the 3 steps to organizing your office. Thank you! Organizing your office is the book I would like because my office is a mess. I used to be organized but it's out of control now. Thanks! Wow, I could use several of the books! Organization has never been my strong point! Probably the time management would be my choice. Thanks for the giveaway! I definitely need to work on my decluttering...so that's the one I'd pick! I would love any of these:Three Steps to Decluttering. Three Steps to Clever Cleaning. Three Steps to Downsizing to a Smaller Residence – Workbook, Ebook. I Leave You a Legacy – Writing Your Life Story and 133 Simple and Creative Ideas for Writing your Life Story. I think I need the decluttering book but I really want to write my life story. I would choose Three Steps to Clever Cleaning, because I am not the best housekeeper and could use help! I definitely need the Three Steps to Time Management for the Stay-at-Home Mom! My life has been chaos since becoming a SAHM. This would help tremendously. I'd pick "Managing your Time, Energy, and Clutter"
I just got to read this;3 Steps to Clever Cleaning. 3 steps to clever cleaning - sounds great! I like the title "Three steps to decluttering". My life is always a cluttered mess! This giveaway is just what I need. I would want the 1 2 3 get organized, but also the cleaning one looks good... I have issues with clutter I fight every day, and I have to clean my house better due to recent allergies being diagnosed. Gonna put your link on my blog, I love this site. I'd choose 3 Steps to Down Sizing to a Smaller Residence, although so many of these books sound fabulous and useful. Thanks for the opportunity to win! I like the "I Leave You a Legacy" workbook! Thanks! Any help in getting organized or in cleaning would be a help to me. Thank you for having this! I would love to win! I really like the Three Steps to Time Management for the Stay-at-Home Mom. Perfect for me. Thank you! I'd like the Three Steps to Decluttering. Organizing Services & Seminars -- I need this. My life is so complicated this would stream line it! Hassle free dinners. I could really use this. Tips for the Stay at Home Mom! Three steps to clever cleaning. Thanks for the contest! I like the 133 Simple and Creative Ideas for Writing your Life Story and I Leave You A Legacy. Tips for a Stay-at-HOme mom! Three steps to organizing my kitchen! I'd choose Three Steps to Decluttering. Who doesn't need less clutter in their lives? Hi, love the idea of the 3 steps to downsizing to a smaller residence as I have been talkng about doing that lately. Mine would have to be the 3 steps to planning your shild's parties. I keep changing my mind, its a crazy business. Thanks. HI, the 3 steps to decluttering looks the best to me! The website is more than a little confusing but I think I found one for writing your life story. I definitely need help with that one as I have always wanted to put it on paper. clever cleaning -- I hate cleaning so if there is a way to get it done more efficiently -- I am in!!!! need clever cleaning! Who knew it would be so hard to keep the kids and the house clean? How did the ladies do it in the 30's and 40's??? There are a lot of these books that I could use but mostly the 3 Steps to Clever Cleaning. Anything to make cleaning easier! Three steps totime management for the stay at home mum! Three Steps to Decluttering...that's the most major step in trying to improve my home so I'm not so embarrassed to have people over. 3 step to decluttering would be a lifesaver! I try all the time but I am a pack rat at heart, not a bad one, but bad enough! I think I would choose 3 Steps to Organizing Your Office or 3 Steps to Decluttering. I'm not sure which...I can't decide. I'm signed up for your email too. I would love to have 3 steps to Organizing Your Child's Room or 3 Steps to Clever Cleaning or the Hassle Free Dinners CD! Awesome selection of products! I'd LOVE to win the Three Steps to Clever Cleaning!! Three Steps to Time Management for the Working Mom! Thank you so much for the chance to win! Hands down, I would have to pick "Decluttering". I would love the 3 steps to organizing for Stay at Home Moms. Thanks for entering me! I would love the Three Steps to Planning Dinner Workbook. I really struggle with what to make each week and this sounds like it would help make this task more painless. I think I could use all of the books offered. I would pick three steps to organizing your office. Thank you! I would choose Three Steps to Decluttering, because I have lots of clutter I would like to get rid of. 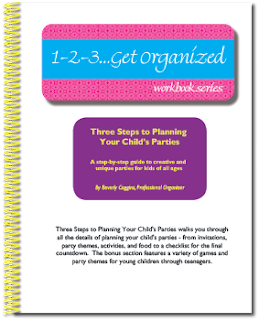 I would choose "3 Steps to Planning Your Child's Parties E Book"! It would be interesting! Great of you to offer this! I subscribed to Mommy's Idea email. I subscribed to your forum. It looks like fun! Hmmm... as I sit here looking at my messy house with one son at school, one son asleep and 30 days until the new one arrives, the Three Steps to Time Management for the Stay-at-Home Mom is something I am in need of. I'd like Three Steps to Time Management for the Stay-at-Home Mom. Thank you!! Three steps to time management for the student, please! I could use help from many of these but the one I would start with is Three Steps to Decluttering. I'd like 3 steps to decluttering. I really want to throw away things more. Three Steps to Clever Cleaning because I need a way to clean faster and easier. I would choose Cooking Up a Family Cookbook. It would be really neat for my brothers and sisters to be able to leave our "family recipes and tips" for our kids to remember their favorites. I would choose Three Steps to Decluttering. That is my biggest challenge. If I ever get decluttered then I will look at 3 steps to clever cleaning. I would pick Three Steps to Time Management for the Stay-at-Home Mom because it is hard to find time to do everything. I would have to pick "Three Steps to Decluttering". I save everything and I have a small house. Thanks for the chance to win!! We would love to win! Thanks for a great giveaway! 123 organized or clever cleaning. I would like 3 steps to time management for working moms. That's just what I need when I feel like things are getting out of control. I'd try: Three Steps to Time Management for the Working Mom. I love the decluttering books, I seriously need them. I am becoming a subscriber! I think the Three Steps to Time Management for the Stay-At-Home Mom workbook is my favorite. Thanks! I could use 3 steps to clever cleaning. My favorite is the Three Steps to Clever Cleaning I like that it includes lists of things to be done and when plus thae alternatives to harmful cleaning products. Thank you for hosting this giveaway! It is very generous of you!!! Wishing you continued success! I would like to check out 3 steps to clever cleaning. I first like the name of that it makes you interested. I, like I'm sure so many others, don't typically like to clean so it makes me interested to see what Bev has got to say about this "not so fun" thing. I would love to have 133 Simple and Creative Ideas for Writing your Life Story. This sounds like such an awesome book, and I have tons of stories to recount, but I don't want to end up sounding stale and rote. This would be an awesome way to 'pump up' my life stories for reading by others, I think. 3 steps to organize your office. No matter how hard I try that is the one room I cannot get organized. I would like the Three Steps to Decluttering book.